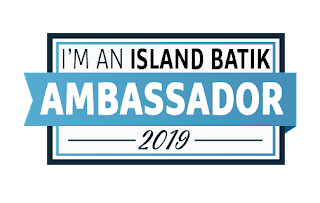 I am beyond excited to announce that I am one of the 2019 Island Batik Ambassadors!!!! Many of the blogs I follow are written by people who have been Island Batik Ambassadors for a year or more. I love seeing the monthly challenges and how each person did something so different with the same theme and sometimes the exact same fabrics. When the call for applications for 2019 came out I decided to apply. Batiks are my first love, fabric wise. While I don’t use solely batiks these days, I’m still drawn by the colors and designs in batik fabrics and that’s usually my favorite section of a quilt shop. Island Batik has such beautiful colors and patterns that the idea of getting to make something with the lovely fabrics *every month* is just so exciting! Isn't this just amazing!!!! Look at all the awesome!! 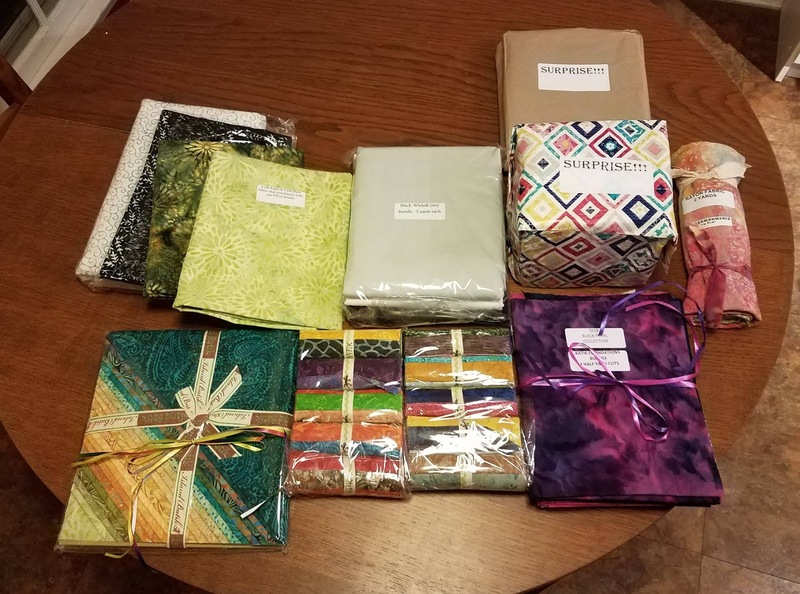 Disclosure: all items pictured were given to me by Island Batik and their industry partners Aurifil, Hobbs Batting, and Accuquilt. Lovely Island Batik fabrics. Look at it all! First, the fabric! Island Batik sent me a 10" stacker of Flea Market (in stores now!) and coordinating light and dark yardage. Flea Market is lovely greens, teals, yellows, and oranges. There is yardage of Island Batik’s new solids in white, gray, and black. I also got generous yardage of a neutral from their basics collection, as well as several half yard cuts from that collection. My basics are mostly in the purple family—someone knows my favorite color! And there were two packages of Stash Builder rolls. Stash builder rolls are precuts of 5” by width of fabric and unrolling the bundles is like the best kind of grab bag! Each Ambassador was also given a secret package--you can see it wrapped and marked Surprise! That is a collection that is not yet released and will be unveiled during a blog hop in August. Everything I’ve mentioned so far are standard batiks (cotton). There were also two rayon items: a lovely black and white scarf and a two-yard cut of multi-colored rayon. I don’t normally sew clothes but part of the point is to venture out of my comfort zone and try new things. 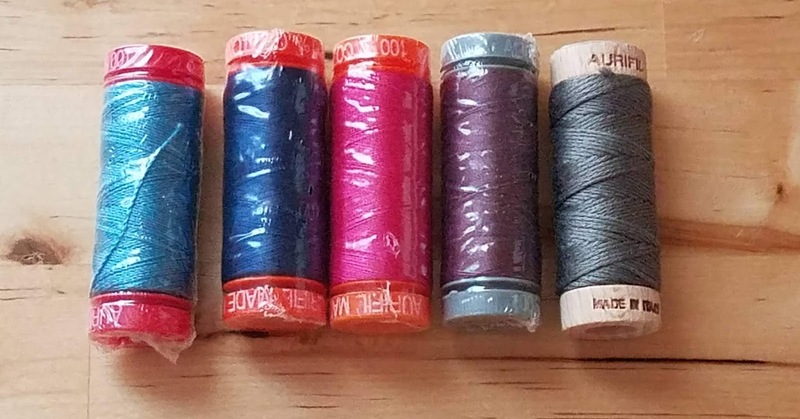 There were also 5 spools of thread from Aurifil. I am in love with Aurifil thread AND they have fantastic customer service support. I’m especially excited to try their floss; mine is the gray spool on the far right. Hobbs batting really spoils us! There are two queen-size batts here, plus silk batting and polyester Thermore to play with. I have never used black batting before and am very interested to see how I like it--and I have a project in mind! Accuquilt is a new industry partner for Island Batik. 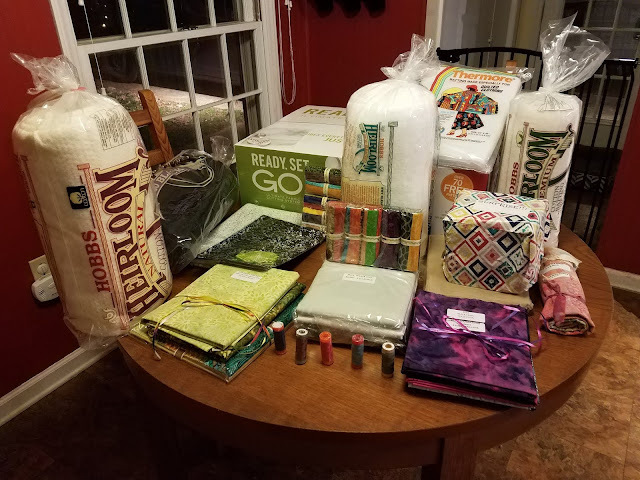 Each Ambassador was sent an Accuquilt GO! cutter, a GO! cube, which is their set of die shapes to make tons of different blocks, a 2 1/2" strip die, and the Quilt in a Day GO! Qube book by Eleanor Burns. 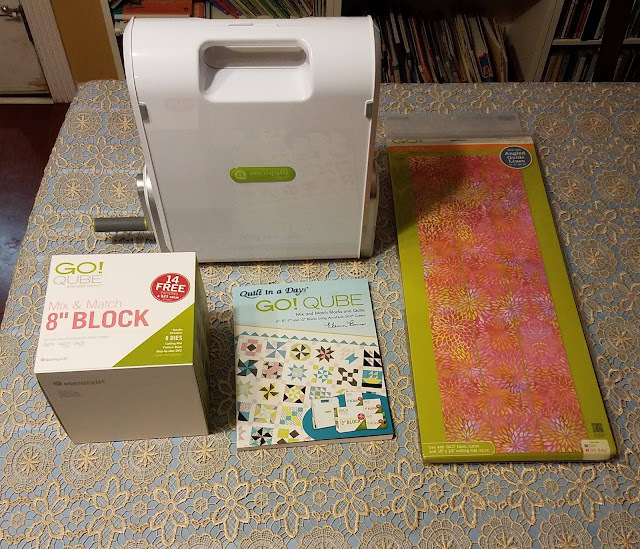 I've had an Accuquilt cutter for a few years now and I LOVE it! I use mostly for cutting my scraps to certain sizes (it's fantastic for scrap management!) and also have a few fun applique dies. I cannot begin to say how honored and thrilled I am to be a part of this program for 2019! My first challenge project is done, but I'm currently in Oregon with family and didn't get to take photos before I left, so you'll have to wait until the second half of the month to see it. In the meantime, visit some of the other 2019 Island Batik Ambassadors! Emily Leachman ~ The Darling Dogwood THAT'S ME!!! Congratulations! 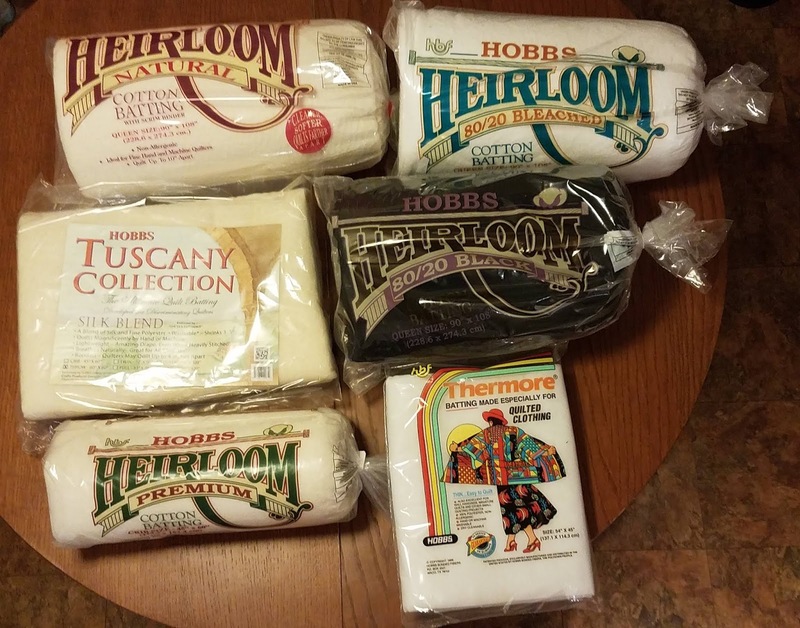 I adore Hobbs and Aurifil too. The black is wonderful to use with dark fabrics. I'll be interested to see what projects you come up with! Wow ! Congratulations! What a great recognition and what fun stuff to play with. I’ve considered applying but I worry about keeping up month to month. I’ll be interested to see how the year goes for you- you will make great things! Lots of fun goodies to play with! Congrats on being selected as an ambassador. Looking forward to seeing how you interpret the monthly challenges. Congrats on being an ambassador this year! I can't wait to see all the fun stuff you create with all this loot!! What a haul! Congrats on becoming an ambassador!